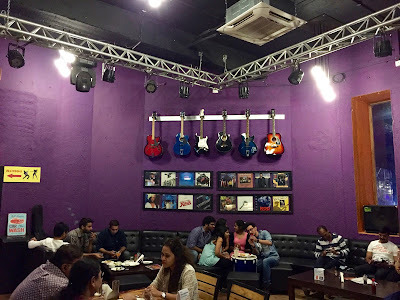 Classic Rock is unlike any other coffee place you would have been to, unless you have visited one of their outlets in the United States. It is like being in a backstage lounge of a rock concert. They are as much known for the variety and the quality of their coffee roasts as for the usually cool and funky ambiance. 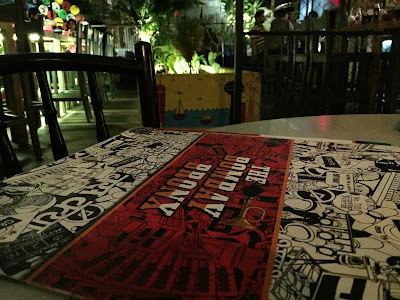 Bombay Bronx is the newest answer to our city’s never-ending quest for new watering holes and they have done a fabulous job of carving their unique identity already. 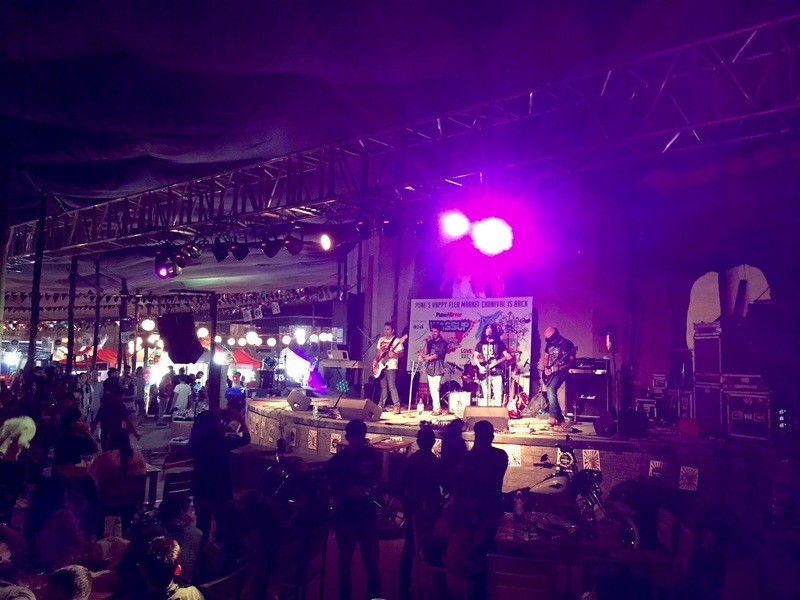 Classic Rock is a relatively newcomer in a highly competitive space. With just two outlets in the United States, they quickly expanded to cover select locations in the Middle East and South Asia, before expanding further into the rest of the USA. 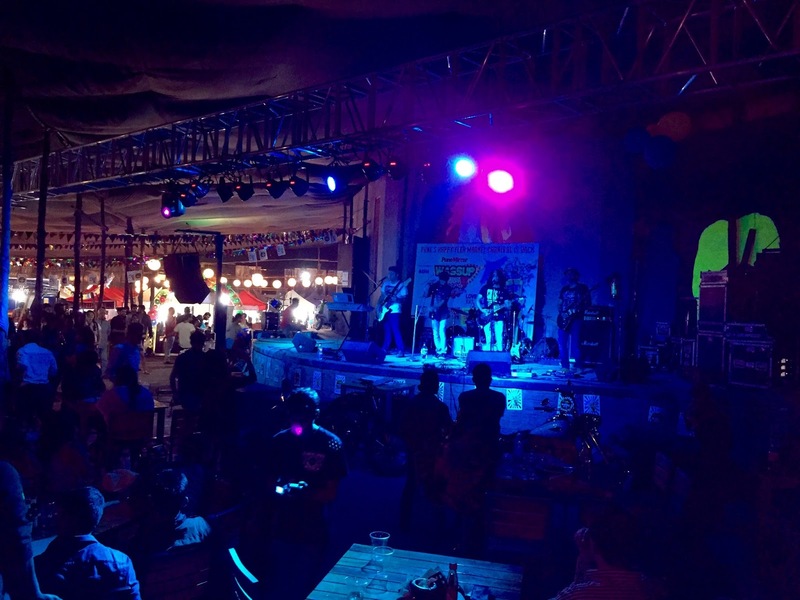 Pune became their first opening in India, and also the first to serve alcohol in addition to coffee. My wife and I ventured into Classic Rock on a Saturday evening when the night was still young. There was a small cover charge, but that was for the Weekend Flea Market that was set up within the open area next to a small amphitheater that had a live band playing rock. Classic Rock turned out to be a fun place but only if you didn’t go there on a weekend expecting to settle in with coffee. 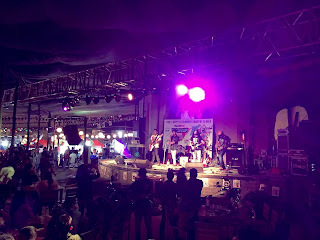 During these evenings, the place gets rather crowded with young people looking to guzzle beer as they enjoy the live music. Not quite like a coffee shop on those days! 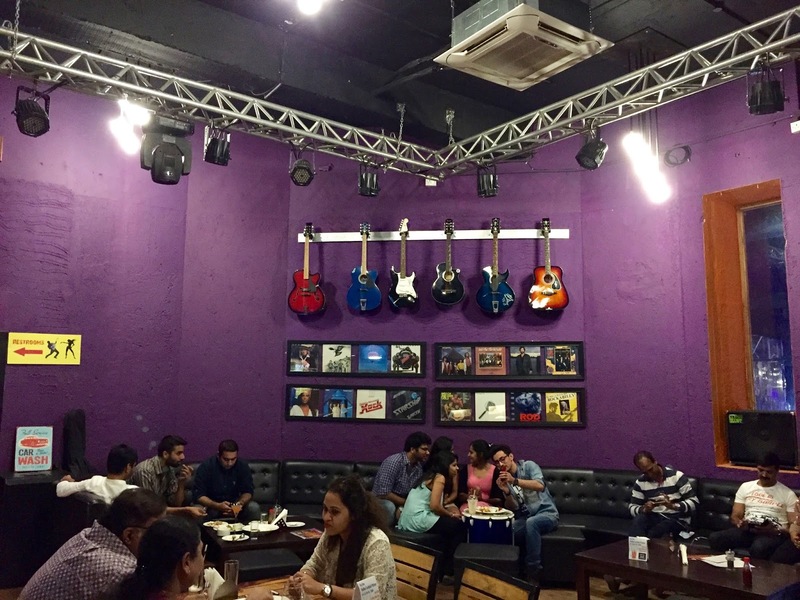 While Classic Rock’s USP has been the coffee, their Pune location is better known for their live gigs and other specials (such as when they got a Master Chef celebrity to host a cooking themed event). Bombay Bronx too wears different hats on different days. Open only during the evenings on weekends, it caters to patrons looking to chill out over their favourite poison, they also have a weekend lunch buffet for families with their kids who can dig into some rather well-made food. 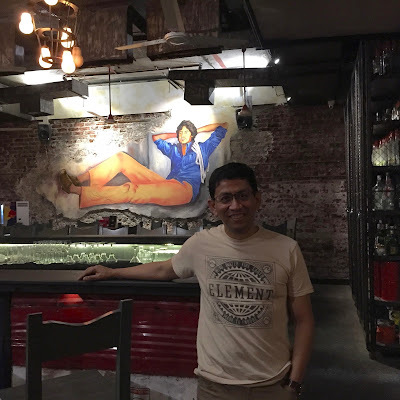 What makes Bombay Bronx unique is the very innovative Bombay themed interiors. Amitabh Bacchan looks down upon you from the iconic poster from Deewar that adorns the bar area. You walk past an area re-created from seats and overhead handles from local trains that are so much a part of Mumbai’s daily life. There is even a Dhobi Ghat area and one that celebrates the famous dabbawalas. Creepily, the toilets have a red light on top with a signboard that says Kamathipura! However, Bombay Bronx is not all high-concept without substance. 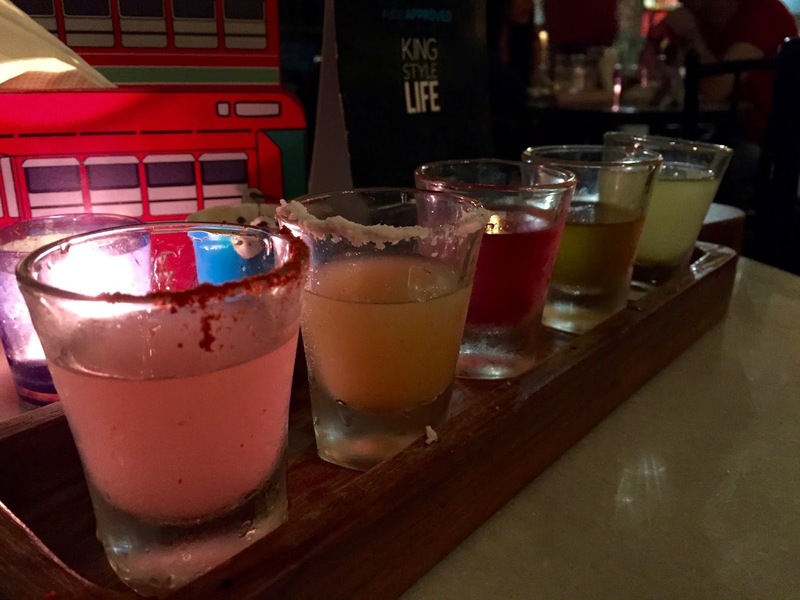 Their cocktails and their bar food are exceptionally well-chosen and well executed. 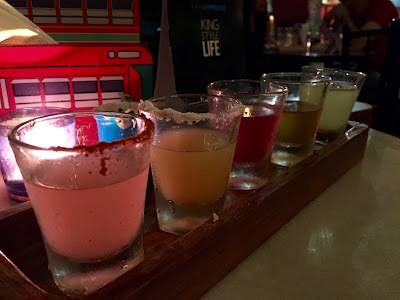 They have some interesting Mumbai-themed cocktails and the cool thing is they give you a tasting flight of their most popular ones so you can try them all and then order the one you prefer. Like many other bars in Pune, I found the alcohol content in their drinks on the lower side. 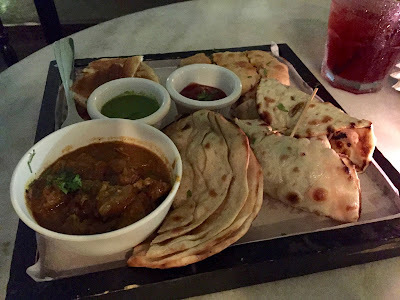 We ordered the Dongri Galli Thali which puts together some of their popular food items into a platter. This was exceptional and every item was extraordinary. The chicken roll, chicken baida roti, mutton sandwich and bhuna mutton with paratha were so very good! 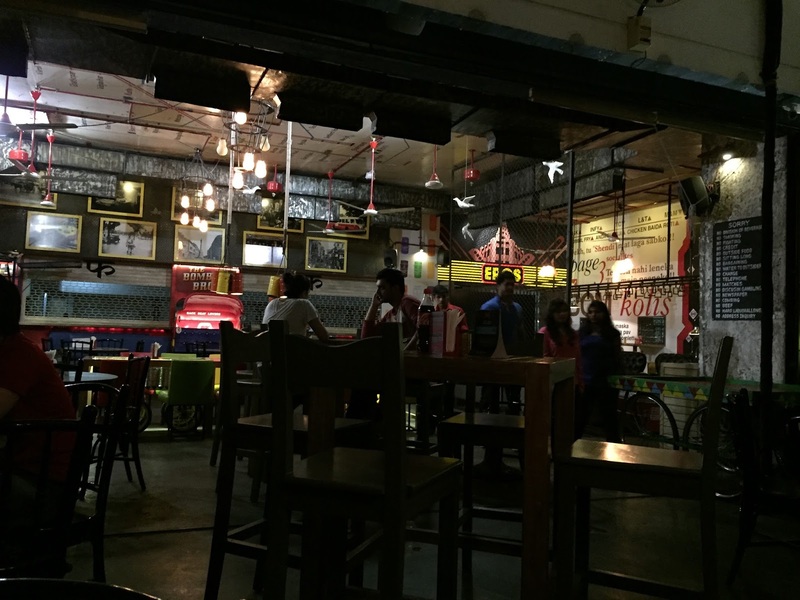 While this a great choice for those looking to de-stress with alcohol in cool surroundings, it can be a great option for teetotallers just because of the bar food alone. Given that this lounge comes to us from the same guys who brought Brooklyn Shuffle, WTF! and Jimmy Hu’s, we shouldn’t be surprised.